Yet another view of the Zhejiang Road Bridge. The lenticular truss is supported on four stocky built-up members at the four corners of the bridge. The bridge was put together with rivets, which has become something of a lost art. I read that when the City of Shanghai was rebuilding the Waibaidu Bridge (at the mouth of Suzhou Creek), they were able to find hundreds of older workers that were still expert riveters. Perhaps they also worked on rebuilding Zhejiang Road Bridge in the 1970s. It appears that the vertical hangers attached to the top chord at the ends of the span are able to slide through the bottom chord and support the floor beams under the deck. The weight of the deck compresses the top chord which pushes the ends of the bottom chord farther apart which lifts up the deck in the middle of the span. However, this type of structure is rather flexible and causes large displacements when a heavy vehicle drives across the bridge. Perhaps that's why there is a 15 ton vehicle weight restriction on this bridge. 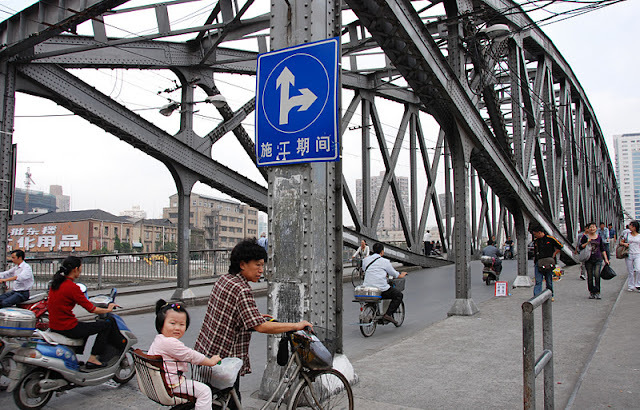 Shanghai's Bridges: Zhejiang Road Bridge (3) by Mark Yashinsky is licensed under a Creative Commons Attribution-NonCommercial-ShareAlike 3.0 United States License.